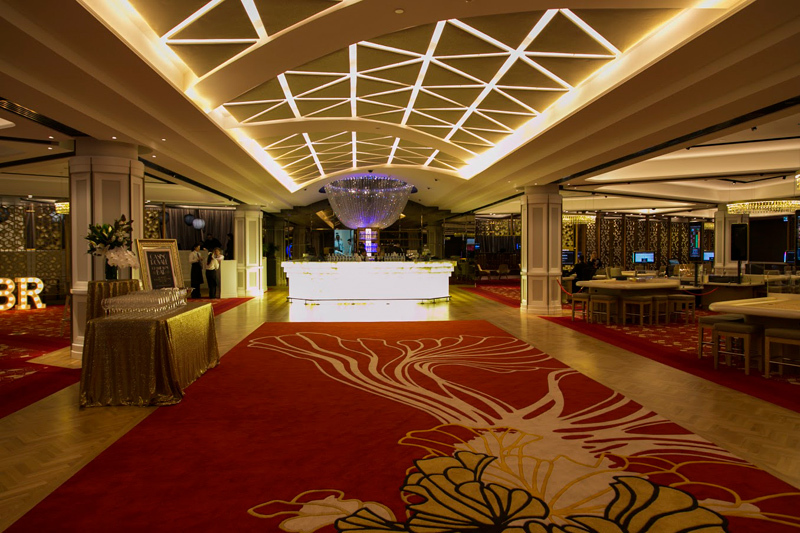 Transformed from dark and dingy to glitz and glamour, Casino Canberra’s re-furbishment was revealed to anxious Canberrans last Thursday. The theme was ‘Casino Royale’ and with a dashing red carpet, Brazilian dancing girls and cocktails-a-plenty, the launch did not disappoint. As we walked in, the foyer was packed with an array of gowns, suits and and champagne as we eagerly awaited the grand casino doors to open. The scene was set with a brass band playing bond classics on the stairs – and when no one else could fit into the foyer the doors were opened and the new-and-improved casino was revealed. Dancing girls were presented on podiums around the space and staff lined the stairs with canapés, drinks and complementary gaming chips. However, the show stopper was the bar. Presented with a cascading crystal centre piece falling from the ceiling, the bar was staffed with mixologists manning their stations, with any cocktail you could name available to order. The cream and red interior made for a great change to its dark predecessor. Looking a tad different to any other casino, Canberra’s version is yet to house any poker machines – something that we were assured weren’t too far away. We had a sneak peak into the rooms for the high rollers – 88 Private and 888 Private. The rooms were designed with a luxe mixture of textures – draping rich curtains, velvet furnishings and embossed wallpaper with pops of gold – and complete with their own bar and personalised service. The whole experience was just oozing extravagance. Gambling proceeds for the night were donated to charity partners; The Ricky Stuart Foundation and Lifeline Canberra – nominated on behalf of Cox Architecture and Aquis Entertainment. With a big band playing, friendly gaming staff to help the casino novice and beautiful canapés provided by Natural 9 – the event was a complete success. To get the inside scoop, we sat down with Casino developers Cox Architecture and Aquis Entertainment… Stay tuned for the interview coming soon!